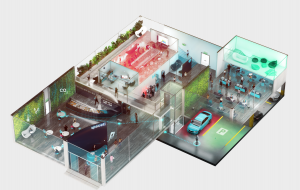 As the race to attract top talent continues to drive enterprises to offer the best in class employee experience, more forward-thinking landlords are investing in smart parking technology. Atlanta-based real estate investment firm Invesco, in collaboration with its tenant MSD Pharmaceuticals, has invested in a smart parking system to solve the problem of a lack of parking availability for its employees. The smart parking system designed by Spaceti, which uses a proprietary IoT sensor and software platform, solved the persistent problem of parking scarcity at the pharmaceutical provider’s Prague offices. “MSD is growing really fast. We are now occupying two buildings with more than 1400 employees and only 200 parking spots which was starting to become an issue. We wanted to give our employees a chance to check available spaces in the garage prior to coming to work,” said Jana Dusatkova, facilities manager at MSD’s Prague offices. “We also wanted to use the smart parking system to do an analysis and see how our employees are using the garages,” she added. MSD’s employees would regularly drive their cars to work only to learn that there was no space available to park. Now by checking availability via a customized mobile app employee can decide whether to drive, take public transport or use a ride-hailing app and reserve spaces in advance. “When it comes to buildings, buildings don’t work for us – we work for buildings,” said Aakash Ravi co-founder of Spaceti in an interview with In-Building Tech who left IBM with seven co-founders with the aim to make “buildings work for people”. Ravi describes the company’s platform which offers a full suite of services including occupancy monitoring, well-being and air quality monitoring, as well as wayfinding and geo-location technologies as literal building blocks that connect disparate systems in the fragmented CRE ecosystem through technology. “There are so many pieces that go into smart buildings. There are a lot of blocks that exist in the built environment that are technologically fragmented. Spaceti provides a win-win interface that combines these blocks together to make buildings assets more accessible to users while increasing value for both CRE tenants and owners,” said Ravi. Spaceti’s plug and play smart parking system uses battery-powered tiny easily placeable dome-shaped sensors that send data to a cloud-based analytics platform using the GSM cellular network is simple, easy to maintain and requires no connection to main power. The system can be installed in new or retrofitted into older buildings in a matter of days and customers can start collecting data immediately. Initially skeptical, Spaceti’s customer MSD Pharmaceuticals and property landlord Invesco who have been forerunners in the adoption smart building technology decided to bank on the smart parking app. “We were pleasantly surprised how quickly and easily the process worked. The beauty of the whole set up is that minimal changes to the existing system if any are needed at all,” said Tomáš Fiala, director of Asset Management at Invesco who added that he sees smart parking and digital access as trends ripe for significant growth in the future. Ravi says technology-based improvements are generating greater transparency between landlords and tenants. “Insights from data analytics of how occupants are using space lead to better decision-making for both parties when it’s time to renew- equalizing the playing field,” says Ravi. For the tenant, applications like Spaceti do a deep-dive into how employees are using and navigating their existing space enabling them to identify pain points and improve employee experience and for landlords, they lead to better asset monetization and add direct value to their property in evaluations and appraisals. Landlords are becoming more strategic about how they are using building assets to enhance tenant experience and monetize under-utilized assets through data analytics-based applications. According to a recent survey by JLL, the clients who adopted CRE technology were 3x more profitable than those so were less engaged with innovation. There has been a shift in thinking among CRE landlords who are recognizing the role technology plays remaining competitive in a marketplace where third-parties and intermediaries like coworking providers have already gained significant traction. “Landlords are realizing that if they don’t change their mode of thinking, other third-parties like WeWork will essentially become agents to help companies find space, leaving them out,” said Ravi. “The risks of sitting on the sidelines are too high, especially when you think about the loss of access to valuable data which will consequently be controlled by third-parties in the future,” he added. In compliance with GDPR, Ravi says Spaceti serves as the processor of the data and is allowed to transfer it from one place to another- but does not own it. “When it comes to the owner of the data that depends on the solution. 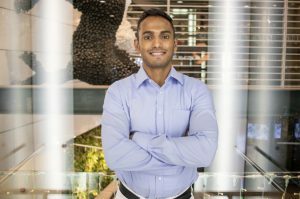 Generally, it’s the tenant who owns the data because it’s based on their space, but in most cases, landlords and tenants work closely to share data and insights,” Ravi said. To date, Spaceti’s platform is deployed in more than 40 projects in 12 countries and the company is aggressively expanding operations in the US and Asia. Spaceti was the winner of the 2018 MIPIM Startup Competition, a collaboration between the world’s leading real estate industry event company and PropTech accelerator MetaProp NYC, and was identified as one of the most promising and innovative companies poised tackle 21st-century urban challenges.